Brown olive | Infonet Biovision Home. Found from Ethiopia to southern Africa, also on the Arabian peninsula and to India and China. 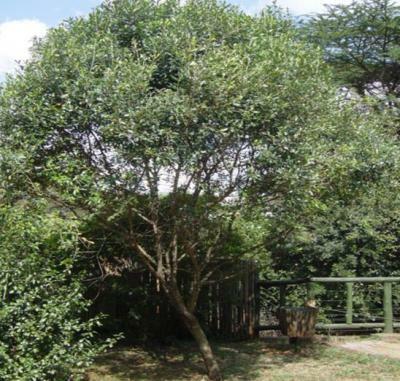 In Kenya found in most inland highland areas from Taita Hills to west and northern Kenya. Common in dry Olea-Juniperus-Podocarpus forests and forest margins, 950 - 2,500 m. Found on rocky hillsides, forest margins and along dry riverbeds, where it may occasionally form a pure stand. Altitude range is between 800 m and 2 500 m above sea level. It does best in good forest soil, but once established, can withstand poor soils with little moisture. Is distributed in agro-ecological zones II - III. Wildings and seedlings (difficult to raise) may be used to propagate it. Unfertilized seedlings show drought tolerance whilst fertilized seedlings do not. Fertilization with adequate watering results in greatly increased shoot growth but little change in root growth, In summary, plants need adequate nutrition and water to grow, and irrigation or fertilizing plants usually increases their growth where water or nutrients are deficient. Fertilization and irrigation need to be carefully managed to ensure optimal growth is consistent with post transplant survival. Pruning, thinning where necessary, pollarding can be used in management of the trees. Seed storage behaviour is orthodox. Viability can be maintained for several years in hermetic storage at 30C with 6-10% mc. The seeds can be stored at dry room temperature for a few years. There are approximately 13 800 seeds/kg. Food: The main olive products are olive oil and edible olives. The fleshy, oil-bearing mesocarp used in commercial olive growing is absent in the much smaller fruits of O. africana ssp. africana. Can also be used for seasoning (fermentation and flavouring milk) and making soup. Fodder: The plants are much browsed on by livestock. Fuel: Rural communities use wild olive extensively to provide firewood. Timber: Wood is hard and heavy; weighing approximately 1 140 kg/cubic m. Sapwood is light brown while the heartwood is red-brown to yellow, with dark figuring. The wood is fine-textured and finishes well, and is often used to make ornaments such as wall clocks and vases. Jewellery items such as beads, brooches and bangles are also made from wild olive wood. Although the tree does not produce sawable logs or branches, there are still several furnituremakers that, with great effort produce furniture from the limited quantities of timber. 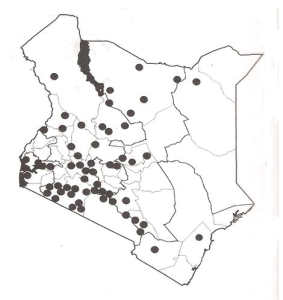 Medicine: The Wandorobo and Kipsigis of Kenya use a root or bark decoction as a remedy for malaria. Reclamation: The high drought tolerance of O. europaea ssp. africana suggests that it is a good candidate for reforestation in semi-arid zones of the country such as north eastern parts. Ceremonial: The tree can be used in performing ceremonies. This is not a serious problem and so no information about the same.